Institutions like schools, hospitals, and universities are not well known for having quality, healthy food. In fact, institutional food often embodies many of the worst traits of our industrialized food system, with long supply chains that are rife with environmental and social problems and growing market concentration in many stages of food production and distribution. Recently, however, non-profit organizations, government agencies, university research institutes, and activists have partnered with institutions to experiment with a wide range of more ethical and sustainable models for food purchasing, also known as values-based procurement. Examines the role of policy and regional or geographic identity in promoting food systems change. Institutions as Conscious Food Consumers makes the case that institutions can use their budgets to change the food system for the better, although significant challenges remain. It is a must read for food systems practitioners, food chain researchers, and foodservice professionals interested in values-based procurement. 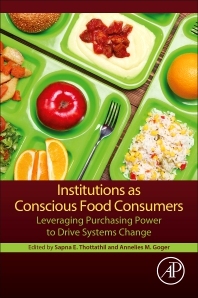 Sapna E. Thottathil is the co-editor of Institutions as Conscious Food Consumers. She has worked on institutional food purchasing and supply chains with hospitals and K-12 public schools while employed at the organizations Health Care Without Harm and School Food Focus, and now with higher education with the University of California as an Associate Director of Sustainability for the University of California's Office of the President. She is continuing her food advocacy work as a Board Member for Pesticide Action Network (North America), as a Council Member for the Oakland Food Policy Council, and as an advisor to the Plant Based Foods Association. She is also a faculty member in the University of the Pacific's Food Studies Program and is the author of India's Organic Farming Revolution: What it Means for Our Global Food System. She holds a PhD in Geography from the University of California-Berkeley, an MSc from Oxford University, and a BA from the University of Chicago. Annelies M. Goger is the co-editor of Institutions as Conscious Consumers. She investigated global value chains and global production networks in wheat and tobacco while employed at the Duke University Global Value Chains Center (formerly the Center on Globalization, Governance and Competitiveness). She also brings previous experience studying globalization, governance, and ethical trade initiatives in the global clothing industry through her dissertation research in Sri Lanka, Europe, and the United States. She is currently a researcher at Social Policy Research Associates in Oakland, California specializing in food assistance, job training, and economic development programs in the U.S. She holds a PhD in geography from the University of North Carolina at Chapel Hill, a MCP from the University of California at Berkeley, and a BA in sociology from Brandeis University.